The Cadets got out to a 2-0 start in the opening period, setting up the blowout win. 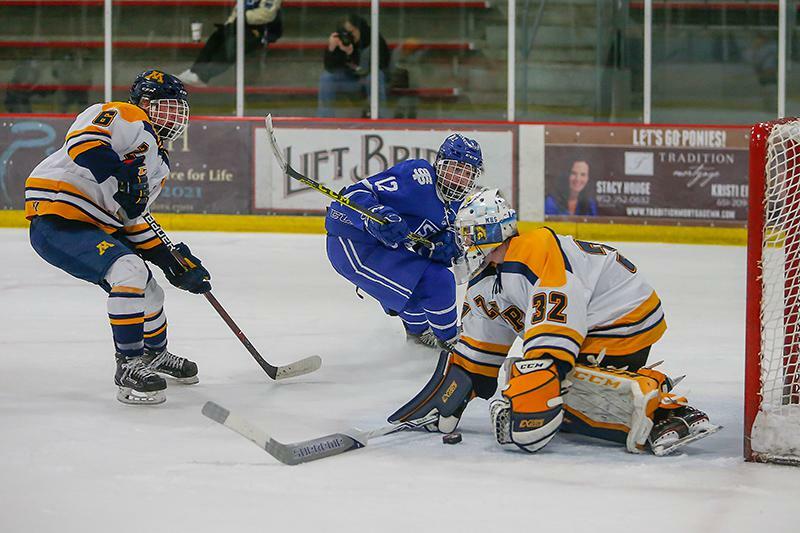 As St. Thomas Academy was closing in on a blowout win over Metro East Conference rival Mahtomedi on Tuesday, Cadets senior forward Cade Huntley had a point-blank shot at the net and a chance to pick up that hat trick. But instead of firing the puck to the net, Huntley passed it off to junior forward Brendan McFadden who finished off the play with his first goal of the game. St. Thomas Academy co-head coach Greg Vannelli said after Tuesday’s game that this year’s team is one of the most unselfish teams he has coached. That was put on display as the Cadets rolled past the Zephyrs 8-0 while 10 players registered points in the blowout win. For St. Thomas Academy, which is ranked No. 2 in the Class 2A coaches’ poll, Tuesday’s game was a chance to rebound from Saturday’s 4-3 overtime loss on the road at No. 15-2A Dultuh Marshall. It was the Cadets’ first loss since a season-opening 5-4 loss to Minnetonka on Nov. 24. St. Thomas Academy (19-2-1, 9-0) rebounded in a big way from Saturday’s loss by jumping out to a 2-0 lead in the first period, thanks to goals from Huntley and junior forward Ben Stucker. The two-goal period was enough for Mahtomedi (14-6-1, 7-3-1) to pull junior goaltender Bailey Huber. From there, the rout was on for the Cadets. They tallied six goals in the final two periods against Zephyrs’ senior goalie Josh Campbell and junior John Poirier. The eight-goal performance was the third best offensive showing for St. Thomas Academy this season. On the defensive side, the Cadets held No. 2-1A Mahtomedi off the scoreboard in the win. After St. Thomas Academy blew a 3-1 lead in Saturday’s loss, the Cadets looked to improve some things on the back end. In goal, senior Atticus Kelly continued his strong senior campaign as he picked up his second shutout in four games and his third of the season. Tuesday’s road game was the fourth consecutive for St. Thomas Academy. All of those have come in the past six days. The Cadets close out the road swing on Saturday against Henry Sibley. So far, the team’s lone hiccup came against the Hilltoppers. After the game, Huntley brushed off any notion that the team was fatigued by the road stretch. He continued to praise the group as a whole and the goals the team has in mind. 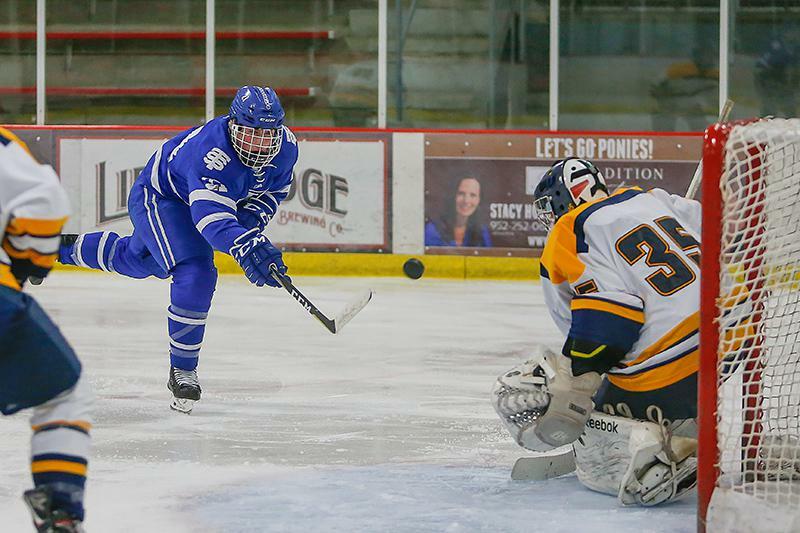 After defeating Mahtomedi 3-1 on Jan. 6, St. Thomas Academy completed the sweep of its Metro East Conference foe in a big way as the Cadets defeated the Zephyrs 8-0 on Tuesday at the St. Croix Rec Center in Stillwater. St. Thomas Academy, which is ranked No. 2 in the Class 2A coaches’ poll, started strong with a pair of goals in the opening period. Senior forward Cade Huntley scored first. Junior forward Ben Stucker made it 2-0 late in the first. In the second, the Cadets (19-2-1, 9-0) continued to pounce on Mahtomedi as St. Thomas Academy scored four goals in the period and outshot the No. 2-1A Zephyrs 15-3. Senior defenseman Chase Foley opened the floodgates for the Cadets just 34 seconds into the period. Foley’s goal was followed up by Huntley’s second score of the game along with a pair of tallies from senior forward Ray Christy. 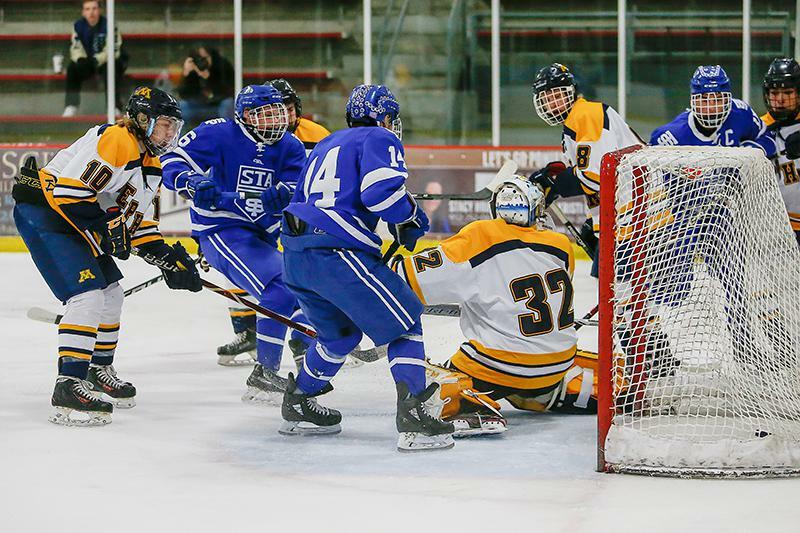 In the third period, two more St. Thomas Academy players found the net as junior forwards Ryan O’Neill and Brendan McFadden each added a goal. The St. Thomas Academy onslaught started against junior goaltender Bailey Huber, who was pulled after making 14 saves in the first period. Senior goalie Josh Campbell and junior John Poirier each got time in net while coming on in relief for Mahtomedi (14-6-1, 7-3-1) and surrendered the final six goals. Cadets senior goalie Atticus Kelly picked up his third shutout of the season while stopping 16 shots in the win.